This entry was posted in Managing risks & hazards on 2018/03/28 by Susan. 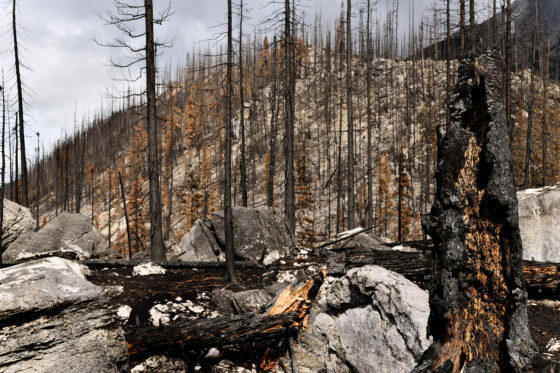 2017 was B.C.’s worst fire season ever. Now, many of these damaged trees are unstable, so people need to know about the hazards of working near them. First, many of the trees in B.C. were devastated by mountain pine beetles. Then more were burned in the 2017 wildfires. Now the province’s forests are filled with damaged trees that are unstable and potentially unsafe. It’s essential that people understand the hazards and risks of working near these trees. “We’re getting questions from different field crews about procedures for how to stay safe while working in these stands,” says Gerard Messier, manager of Training and Program Development for the BC Forest Safety Council. A “stand” is a community of trees that have similar qualities. He recommends the crews read Wildlife/Dangerous Trees Awareness: A Safety Guide for Logging Operations and the related guide for silviculture activities from the Wildlife Tree Committee of B.C. The guides provide best practices and describe how damage to roots, branches, and other parts can make trees unstable or hazardous. What is a dangerous tree? The safety issues associated with dangerous trees don’t affect just workers in the forest industry. They are also a concern for agricultural workers and anyone else at work in areas with or near such trees. As always, the risks must be assessed and mitigated before any work can start. A danger tree assessor needs to have proper training to do the assessment and make recommendations on managing the hazards. The Wildlife Tree Committee offers Wildlife/Danger Tree Assessor’s courses. The assessor should conduct a thorough site assessment to get an understanding of the extent of the damage in areas where workers will be, Mike says. Depending on the situation and the extent of the damage, the surrounding area could be flagged as a No Work Zone (NWZ) large enough to ensure workers are protected. Read more information about salvaging burnt trees in this story in the Logging and Sawmilling Journal. Also read my post Removing danger trees killed by pine beetles. And, as always, please leave a comment about your own experiences.